After leading the way and hosting Australia’s first television gay wedding, Neighbours is again embracing diversity by joining the Sydney Mardi Gras Parade this year and filming scenes for an upcoming episode. Fremantle, the company that produces Australia’s longest running soap announced the partnership with Sydney Mardi Gras that will see 25 cast and crew marching along with a garden wedding float to celebrate equality and inclusiveness. A unique and ground-breaking element of the Neighbours appearance in the parade will be the opportunity for Neighbours to shoot scenes during the Parade festivities for a storyline that will feature in episodes in 2020. This will be exclusive content for Neighbours and showcase Mardi Gras to the Neighbours global audience. 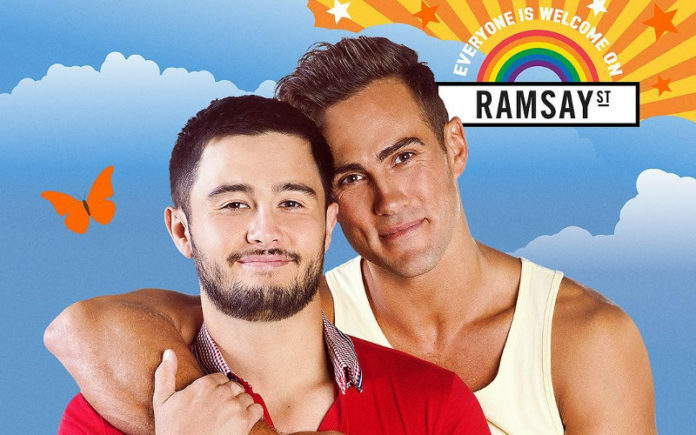 Matt Wilson and Takya Honda who play married gay couple Aaron and David on the show spoke to Ten News and suggested the filming of their onscreen relationship at the parade will be very important for the storyline going forward. “This is sort of the first time we might even have a live audience to interact with,” said Wilson. “This will be the first time a drama’s shot within the Mardi Gras and it will be a core element of the episode, it is a pretty cool thing to be a part of,” said Honda. The inclusion of Neighbours in the Mardi Gras Parade has been a long-time passion project for Fremantle Executive Steven Murphy. 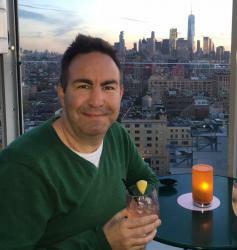 “To be able to walk up Oxford-street on the night of Mardi Gras and be able to rejoice in being part of a show that celebrates equality the way that we have,” Murphy explained to Ten News. Jason Herbison, Executive Producer of Neighbours said everyone is welcome on Ramsay Street. “We can’t wait to stand among our brothers and sisters at Mardi Gras and share our commitment to equality,” Herbison said. Terese Casu, CEO, Sydney Gay and Lesbian Mardi Gras said they were absolutely thrilled to see LGBTQI representation on one of Australia’s most iconic TV shows. Neighbours introduced the first regular gay character to Ramsay Street in 2011 and have maintained diversity in the regular cast ever since, currently with three core characters from the LGBTQI community. The Sydney Mardi Gras Parade will be held on the night of Saturday 2 March. Neighbours will also have a presence at Mardi Gras’ fabulous community event, Fair Day on Sunday 17 February.